The decorations aren’t the only things that you’ll want to be sparkling during the festive season. You’ll want your home gleaming, too, and ready for all the family and friends who are likely to drop by to share in some holiday cheer. Here are some tips you might use to keep your home snow white clean during the holidays. Giving your home a really good cleaning prior to the festivities starting will help you keep it looking wonderful the entire holiday season. If you’re pressed for time, you might want to consider getting the experts in for a one time house cleaning. It’s a gift you’ll be glad you gave yourself! It will also keep you motivated to keep things neat and tidy. You know those boxes sitting in your utility room that you’ve been meaning to take to the thrift shop? Well, now is the time to do that! The more items that you can get rid of that you’re not using or that have outlived their purpose for you and your family, the better! Overdoing the tinsel can just make things look tacky. Choose holiday decorations that are tasteful. A beautifully appointed Christmas tree, perhaps some garland and sparkling decorations on the mantel, and a wreath on the front door is all you’ll need. When you take something out to use it, be sure to put it back once you’re done. Get kids to put their toys away. Put away any craft items you’ve been using or cooking appliances you’ve dug out to make those festive goodies. Show off your clean, organized abode by letting as much natural light in as possible. Pull the curtains back and roll up the shades. Sunlight makes spaces feel warm and inviting—just the kind of feeling you want to have during the holidays. 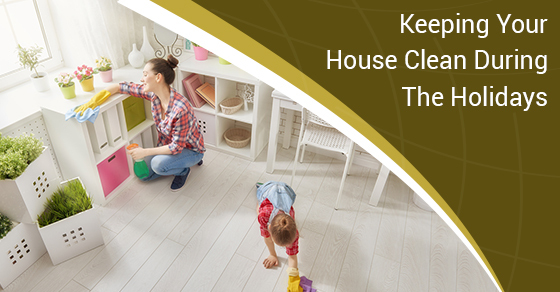 If you have someone come in for a one time house cleaning, make sure you keep things in order by scheduling times to give your home a quick cleaning. There are chores that can’t be put off for long, like laundry and doing dishes. Staying on top of these things will allow you to enjoy the holiday season without stressing about a messy house.